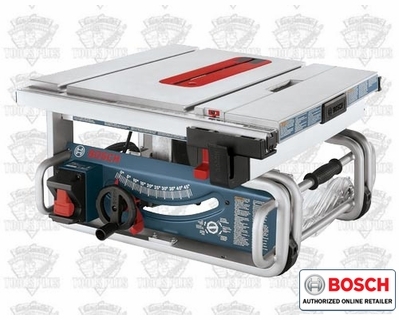 Whether you use it on a bench top in your workshop or on a pair of saw horses at the jobsite, the Bosch GTS1031 10" Worksite Table Saw will give you the professional grade accuracy and reliability you expect from all your tools. And when you need to take it back and forth between the shop and jobsite, it's compact and portable design will make transporting it a breeze. The tubular steel base design incorporated a comfortable single hand carry handle and allows the saw to be stored on its side to take up less space during transport. This saw goes wherever the work takes you, plain and simple. The under table storage area even allows you to store all the accessories you need to keep working all day long, and the modular blade guard system makes this saw both safe and accurate. 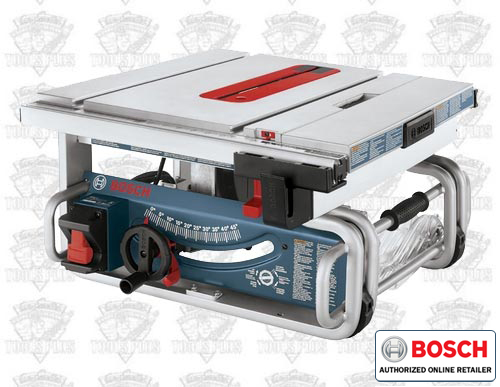 Give your back the rest it deserves and give your results the quality you insist upon with the Bosch GTS1031 10" Worksite Table Saw. Depth of Cut at 90 Deg. : 3-1/8"
The Bosch GTS1031 saw is a long time coming! I am now able to carry a table by myself up a narrow stairway. I have no worries about dinging any walls, it is awesome. This tool is practically ready to go out of the box. It took me a few minutes for me to set this worksite table saw up but then I was good to go. The fact that all the accessories store underneath is great because everything should be there, provided I don't lose something along the way. The saw has some weight to it but being able to carry it one handed is a feature that can't be beat. Truly a PORTABLE saw! I am a contractor who uses my tablesaw daily. I was looking for a saw that could make my life easier. The new Bosch GTS1031 saw is that unit. The side handle allows for one handed carry and it stores compactly in the truck. I can't tell you how many times I had to stack heavy things on top of my old saw just to get everything in the truck. This saw can sit on its side with no worries. It is compact and fits in any corner so you don't have to worry about it getting damaged. The unit is powerful and has all the extras you need. Thanks Bosch you got it right! I've bought two of these saws, after having owned the larger Bosch portable for years. I needed more space in my truck. This is a great machine except for one thing, which is really one of the most important aspects for my trim carpentry business. Both machines have arrived with what I consider inexcusable play in the arbor. One can hold the blade between two fingers, tilt it side to side, and easily feel the slop. This causes a crude cut quality even with the finest Forrest blades (toss the included, thin kerf blade immediately). I took the first saw to my local Bosch service center, where they succeeded in replacing a part or two and got the slop down to 0.0048 inch; by their measurement. They told me Bosch factory tolerance allows for up to 0.018 inch of play. What a difference! I can rip hickory with a very nice cut edge (with the Forrest blade). Now I'm going to take my second saw there, too. The standard throat plate is unfortunately flimsy and easily bent, which can allow your workpiece to lean during a cut, and the optional zero clearance plate is an even flimsier plastic piece that's formed in such a way as to keep you from using the riving knife for beveled cuts. I've now made my own plates. On the plus side, I use dust collection on all my tools, and when hooked to a Festool vac, a large percentage of this saw's dust is captured, which is great. The saw has plenty of power, and the fence is good. The machine has a lot to recommend it, and most users probably aren't as concerned as I am with cut quality. ConsPoor cut quality due to excessive play in the arbor, which seems to be designed into the machine. Very poor throat plates. The throwaway push stick is hardly ergonomic and is a rather crude design. Make or buy your own. This is the best portable table saw I have ever used. 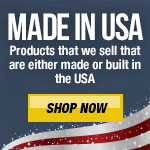 It is light weight and compact, easy to pack into the truck and haul into job sites. Easy to carry through finished spaces without damaging walls or doors. Powerful motor rips flat stock and framing stock easily. Nice on board storage for tools, and fence stores out of the way under the table. Fence self aligns easily for straight rips. The saw came perfectly setup right out of the box. Blade was square to table and parallel to miter slots and the fence. 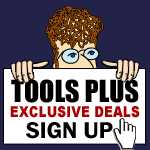 Tools Plus Rocks! I received the saw two days after placing the order. to date, I have only used the saw a few times but it feels like a quality saw with lots of features. I bought it to keep in my enclosed trailer for work. On my last saw, I had to remove the guard on top to store it in my trailer. Of course it didn't take long for it to break and then not replaced. This saw has a removable guard that can be taken off without tools and stored under the table in a minute or less. I would highly recommend this saw. I am beginning to like Bosch their tools and appliances seem very well thought out. The wrenches for replacing the blade were a bit hard to find (under push bar mount). The mount for the raving knife and blade guard can be a little tricky until you get used to it. ProsSmall Portable Cuts well with plenty of power Takes a stacked dado blade. Fence is easy to adjust for a portable table. All accessories mount inside saw frame for easy storage. Dust collection was good. ConsA bit heavy for a portable saw. The blade height knob is a bit of a knuckle buster because it is too close to the power switch (only when blade is vertical). The mount for the wrenches and push bar is a bit flimsy (do not over tighten, cracks VERY easily).